Personnel: Bobby Messano (vocals, guitar, background vocals); Tracy Nelson (vocals, background vocals); Ivan Neville (Clavinet, Hammond b-3 organ); Mel Watts (drums, percussion, background vocals); Steve Geller, Whit Lehnberg, Geoff Wilbourn, Galoris Brownley, JoeBaby Michaels, Dave Rose (background vocals).Audio Mixers: Whit Lehnberg; Josh Fairman; Geoff Wilbourn; JoeBaby Michaels.Liner Note Author: John “Blueshammer” Hammer.Recording information: Scanhope Sound; The Legendary Sound Emporium Studios, Nashville, TN.Photographer: Max Ralston. Welcome to deltaville is available for the first time in two years!! factory fresh and signed by bobby himself with free shipping!!! Deltaville is a small town in Virginia, situated on the Chesapeake Bay. It is an almost surreal spot, with boats floating on the waters of the bay, sea shore styled homes, and small inns and restaurants ready to serve both locals and the occasional weary traveler looking for respite. It is an idyllic setting, a place to come to, get absorbed into, relax and enjoy. 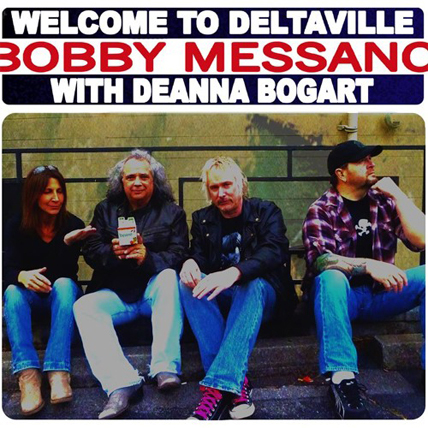 And so, too, is this new album from Bobby Messano. It is a blues and rocking locale where the listener can park themselves, absorb the wondrously fresh sounds and revel in interesting songs offered up that are both new and old. Joining Messano on this endeavor is his ever-staunch and steady band mate Steve Geller on bass. Geller is a rock solid bass player who is intense yet subtle, a man who you sometimes don’t notice that he’s there but if he were not things would quickly go askance. On drums is Mel Watts from the Little River Band, another backline specialist whose approach is professional and top notch. That is the core of Messano and his band: he and Steve and Mel, one of several drummers who support Bobby in his travels. They alone are formidable and exciting, but adding so much to the mix here is Deanna Bogart. Her sax and keyboard work along with some vocals are stellar and make this a richer and lusher sounding CD overall. Ivan Neville also appears on B-3 and clavinette as does Tracy Nelson on a duet and backing vocals. What a superb cast of characters! Messano begins the set with a gutsy version of Otis Rush’s “All You Love I Miss Lovin’”. His guitar really stings and Bogart’s sax wails like a banshee as he and the band set the stage for a great set of tunes. I’ve seen Bobby open recent shows with this cut, but the addition of Bogart is exceptional and the overall mix is superb. Up second is “The Invisible Man,” where Messano’s sings of the hidden hell of being visibly seen yet remain unnoticed. It is a mid tempo, driving rock tune with huge guitar and organ lines that solidify the cut. One can almost feel the strings bend on Messano’s guitar here. He transitions into the title cut, a ballad that Messano floats vocally through with backing vocals echoing the welcome to the near-mystical place of Deltaville. The song drifts with purpose over waves of comforting sounds and builds to a big finish with a nice slide backing the vocals. This is easily Messano’s best effort to date. His last CD was super and he’s raised the bar even higher with this album. Go look for the CD with the take-off of the old John Mayall and the Bluesbreakers album cover with Eric Clapton, buy it, spin it and relish it- you will not go wrong. I most highly recommend this!. 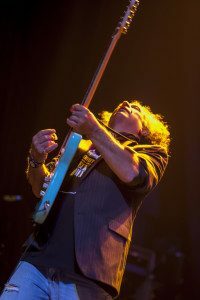 Reviewer Steve Jones is president of the Crossroads Blues Society and is a long standing blues lover. He is a retired Navy commander who served his entire career in nuclear submarines. This is a great cd by Bobby. He really shines on guitar and vocals. Deanna is also great. I have three of Bobby’s cd’s and I love his stuff,he is a great bluesman! His choice of songs is awesome.